As a hamster owner, you’re probably wondering about avoiding dangerous foods for your little voracious cuties. They love the occasional treat – don’t we all? – but some things can be harmful to an animal, even more so to a small critter like a hamster. To help you out, we’re prepared a list of the dangerous foods you must avoid. Surprised by some of these? We were too. Keep reading to learn which of these can be fed in moderation and which are absolutely big no-no’s, and to see why an innocent looking lettuce or celery could, in fact, harm your hamster. A wild hamster’s diet is made of vegetables, roots, some nuts, insects and even small lizards when they can catch them. In other words, hamsters are omnivorous and need a varied diet to stay healthy. 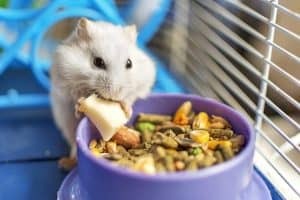 Owners of pet hamsters should rely on high-quality commercial hamster pellets to provide their pet with a balanced nutrition. Trying to diversify your hamster’s diet is not necessarily a bad idea. Diversity is good – for a hamster’s health and general well-being. As long as you make sure most of your hamster’s diet is balanced (usually by means of providing a quality hamster-specific commercial food), adding fresh fruit and veggies is a great idea. However, once you go beyond commercial food and treats, you need to pay special attention to what it is you’re giving your hamster. Feeding the wrong foods can definitely be risky for the well-being of your pet. Even when feeding a seemingly safe food as a treat, make sure you limit the quantity. These are treats and should be limited to up to 5% of your hamster’s diet – the rest of it should be made up of quality balanced hamster food. Pay special attention to fruits of all kinds. Fruits are high in sugar content and while they provide important nutrients, they should only be fed in very small amounts. Even a whole grape is too large for your hamster. As a rule of thumb, limit fruit and other treats to approximately half-a-teaspoon worth, no more than 2-3 times a week. If you’re already feeding your hamster the foods on this list, we recommend you stop doing so immediately. While not every food is fatal, they’re all a bad choice of snack for your furry friend. If you get your hands on bitter almonds, the effects could be deadly. These almonds contain emulsin, an enzyme, that produces essential oils, cyanide, and glucose. Compared to sweet almonds, bitter almonds have 42x the cyanide. If your hamster eats too much cyanide, it will kill them. It doesn’t matter what kind of vegetable we’re talking about here. Even if they’re the veggies your hamster should be eating, like cucumbers, carrots, broccoli, cauliflower, or chicory, if they’re not clean, your hamster shouldn’t have them. Just like you wouldn’t eat fruits or vegetables without washing them first, your hamster deserves the same consideration. There’s always the risk of pesticides getting into their system. Sometimes bacterial strains like salmonella can get through via unwashed produce, too. As you know, most vegetables are a-okay for your hamster to consume, unless of course, we’re talking about garlic and onions. Why is this? These are spicier vegetables. As for onions, these vegetables contain a substance known as N-propyl disulfide. This can affect the red blood cells of a hamster. As for actual peppers – some types have varying degrees of spiciness. Avoid those at all costs. As for sweet peppers, such as bell peppers, they’re best consumed in moderation. They are acidic and can upset a hamster’s delicate system if consumed in high amounts. And make sure you lose the seeds and stalks first. Another vegetable (okay, technically it’s a fruit) that can hurt your hamster is the humble tomato. Although it’s sweeter than most vegetables, tomatoes are indeed quite acidic. If your hamster were to munch on too much of one, they’d end up with diarrhea. Now, tomatoes, when fed in very small amounts, are permissible. When we say small amounts, we mean half of a single teaspoon. You should also avoid ever letting your hamster consume the leaves of a tomato. These are toxic and thus can be deadly if eaten, even in small quantities. For that reason alone, you might want to omit tomatoes from your hamster’s diet altogether. These starchy foods may bind us, humans, up, but they will do the exact opposite to hamsters. Instead, the hamster will come down with diarrhea. When severe enough, all that diarrhea can cause dehydration. In hamsters, excessive dehydration can kill. Your hamster’s eyes will look sunken, they’ll be weak and slow, and they won’t want to eat if they’re dangerously dehydrated. You may also notice their skin loses its elasticity if touched or pinched. 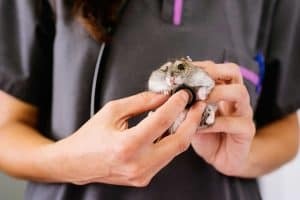 The best thing you can do is take your hamster to an exotic animal vet if you notice your hamster is showing signs of dehydration, as by the time it is clinically apparent, it is very severe and your hamster likely needs fluid support. Read more about dehydration in hamsters in our health guide here. Also, if left raw, potatoes and their tops can be toxic to hamsters. This does not go for cooked potatoes, but you should always remove the skins just to be safe. Some fruits and vegetables you might feed as treats to your hamster have naturally-occurring sugars in them. These include skinless sweet potatoes, apples, bananas, and the like. Those are fine to give to your hamster. It’s processed sugars you need to worry about. Just like processed sugars can boost our cravings and increase our waistlines, they don’t do our hamsters any favors, either. Eating them can cause your hamster to gain weight, which can be detrimental to its health. Their teeth will also be negatively affected, as your hamster’s chompers could rot. You know, kind of like ours do if we enjoy too much sugar. If you see any of those ingredients (as well as anything that ends in “sugar”) on the ingredients list of your hamster’s food, it’s time to switch brands. We hope this goes without saying, but your hamster does not want chips, candy, cakes, cookies, or any other junk food. The same goes for your cats, dogs, and other household pets. The high sugar and/or salt content in these foods can lead to upset stomachs, diarrhea, and dehydration. There’s also the processed ingredients, which are no good. These may be hard to digest for little stomachs like your hamster’s. It’s fine if you yourself want to partake in some junk food, but keep it away from your pet! Peanuts can sometimes contain a toxin known as aflatoxin. The Aspergillus parasiticus and Aspergillus flavus are the two fungi responsible for making aflatoxins. The fungi prefer humid and warm environments to thrive. According to Dr. Alicia McLaughlin, DVM, aflatoxins can be present in small amounts in any peanut-product you feed. These small amounts are enough to kill a hamster. Even if you only feed a small piece of a peanut, it could be fatal IF it happens to contain aflatoxins. Even human-grade peanuts can contain small amounts of aflatoxins, and a small amount for a person is a large amount for a hamster. Feeding peanuts to small animals is kind of like playing Russian roulette – most of the time you will be fine, but there is always a chance that it could be deadly. While it’s ok to feed insects, beef is not a natural food for hamsters. According to Dr. McLaughlin, the risk of obesity, heart disease, liver disease, and kidney disease warrants avoiding meat in your hamster’s diet. You could try small amounts of chicken or salmon on rare occasions – but even those aren’t necessary. Unless you’ve found this out the hard way personally, then you might not know that you’re not supposed to eat raw rhubarb. Consumption can sometimes lead to uterine contractions, watery diarrhea, and intestinal pain. If you continue to eat it, you could later get an abnormal heart rate, bone loss, and muscle weakness. This is what happens when people eat rhubarb, by the way. If the vegetable can do that much damage to us, then why give it to your hamster? Any part of the rhubarb—be that the stalk, the ends, or the leaves—should not be fed to your hamster raw. While cooked rhubarb is fine in small quantities, do you really want to risk it? We already mentioned that your hamster should be restricted from sugary treats, but we wanted to mention chocolate specifically. Dark chocolate is the worst offender, but obviously you should not feed your hamster any kind of chocolate. Why is that? Chocolate has theobromine, a bitter alkaloid that naturally occurs in cacao plants. It’s also in the kola nut and tea plant leaves (so keep your hamster away from those, too). In hamsters, theobromine can lead to circulatory issues. If you’ve had a cat or dog in the past, you already know not to feed them chocolate. Extend this practice to your hamster as well. Have a Healthy, Happy Hamster! 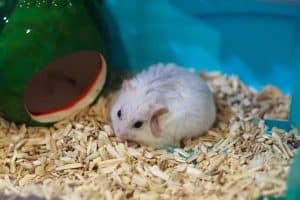 While the above information is a lot to keep track of, it’s imperative you do so for your hamster’s health. If you don’t feel comfortable feeding your hamster something, then don’t do it. Keeping them on a simple diet of pellets and limited fruits and vegetables won’t bother them at all. In fact, it’s probably the best solution for both pet and owner!